iderdider....: back to the 'patch. I wasn't going to post today in preparation for November. But then the girl has to go and be all cute and covered in cinnamon sprinkles. And I'm a sucker for cute. 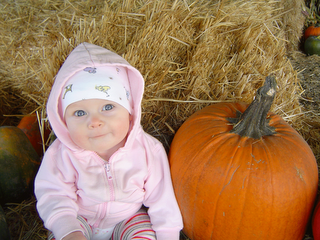 Here's her round pumpkin head a year ago on our trip to the 'patch with our MOPS friends. And in the same spot with the same friends today. Last year, she cuddled in the sling. This year, she ran. No more posts from me until Thursday. And then, I fear, much more than any of us want to hear. Can't wait for NOVEMBER!! Yipee! I love that she is in pink both times, such fun to see her running around. She is just soooooo darn cute. Claire, you are soooo cute!!! what a difference a year makes! you should do the photo again next year. still so cute. What a cutie pie! 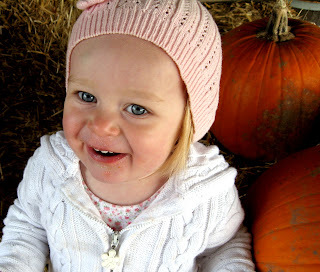 I loved watching her at the pumpkin patch! Do you mind e-mailing me this pic for the slide show i'm putting together? The worst toy Grace ever played with was her own poo. Tom, I think that was actually the worst snack that Grace ever ate. You're right, and i'm an idiot b/c i posted that last comment under the wrong post (was supposed to be the one about toys! ).